Our entryway is a continuous work in progress. We do not have a closet for coats near the front door, so everything we need to go out into the world needs to be accessible and still not look like a complete disaster. Once I decided to get rid of our tiny storage bench and replace it with the Bekvam stools, I knew I would need another piece of furniture to store hats, gloves, and scarves. I did a lot of research on dresser styles trying to decide what would work for us and not be crazy expensive. I wanted to be able to put shoes under the dresser, and have enough drawers to keep mom, dad, and kid stuff separate. I wanted a place to put a vase with flowers, and mail, and keys, and a lamp. It also needed to be smallish, as our entryway is not huge. Not too much to ask, right? I love to look at furniture online at places like Joss & Main, and Anthropologie. 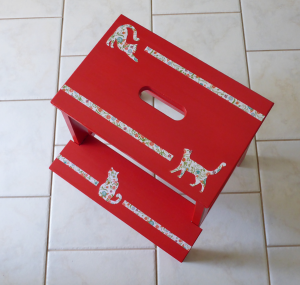 I was originally inspired by the Indian inlay furniture that has become so popular. After I found an IKEA hack that uses stencils to mimic the appearance of bone inlay, I was very excited to try my hand at stencilling. How hard could it be? I watched a lot of stencilling videos. 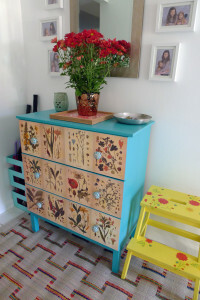 I ordered the stencils and bought the 3 drawer IKEA TARVA dresser and left it to wait patiently in our garage over the summer while I worked on the entryway stools. For the dresser, I decided to use Sherwin Williams Pro Classic paint. I’ve decided that better paint really does make a difference. The paint definitely goes on smoother and feels more durable. It took me a long time to paint as New Jersey is so humid and I wanted it to dry really well. But when I finally had my blue dresser pieces, I set them out and started to stencil. It looked awful. I wiped it off and tried again. Blurry and nothing like the crisp pattern I had envisioned. 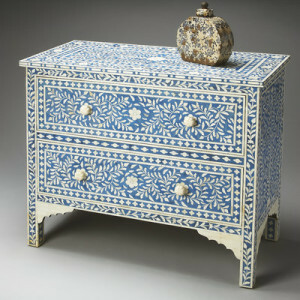 Stencilling on paper worked for me, but it did not work on the dresser’s painted surface. As smooth as it was, it just wasn’t smooth enough. I stopped for the day and rethought my plan. 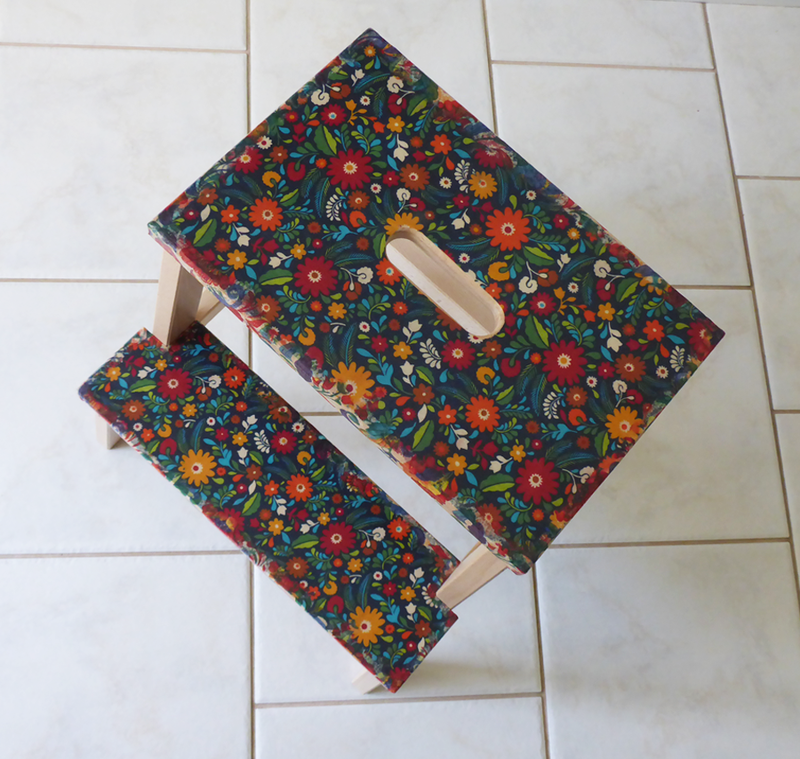 While I was looking up ideas for the girls’ stools, I came across a lot of beautifully decoupaged furniture. If the stencil idea wasn’t going to work in the way that I wanted it to, I was more than willing to try a completely different approach. I adore floral designs. 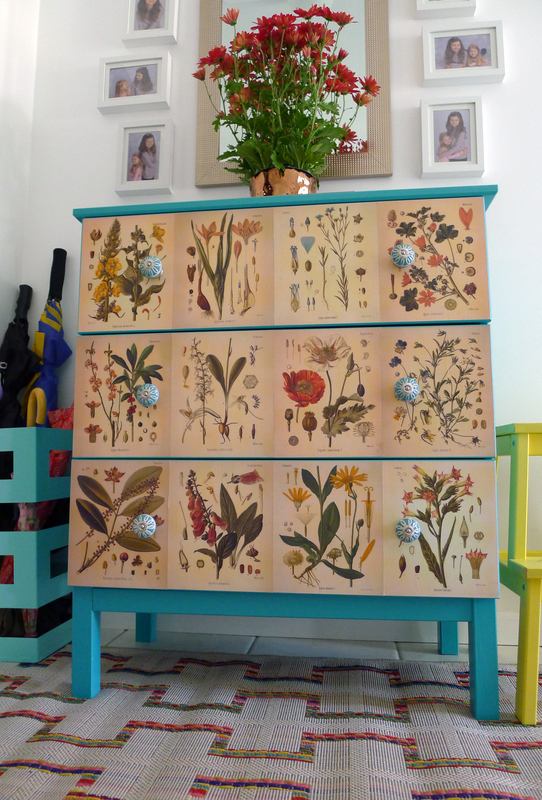 If you type “botanical decoupage dresser” into google images, you come up with some truly lovely pieces. This being the first large piece of furniture I was working on, I felt like I needed to keep it a little simple. I also wanted to finish the dresser before winter. I scoured the internet for botanical prints, and finally found a wonderful source here which mentioned the Missouri Botanical Garden online collection of prints. Jackpot! I found more than enough beautiful prints to decorate my dresser. I printed many (too many!) botanical prints out on a regular inkjet printer. I covered them with a layer of Golden gel medium to seal in the ink. I was worried that the ink might run but it didn’t smear much at all. Then, I cut and adhered the prints to the drawer fronts with mod podge. I put on a couple coats of polycrylic to seal them a bit more. I assembled my dresser and added pretty knobs I found at Marshall’s. I’m very pleased with the way the dresser turned out. It’s a cheerful spot to locate all of our junk. I finally have a dedicated place to put pretty plants and bouquets of flowers. We have a small ceramic wax melter that doubles as a night light, and a bowl where I can always find my keys! Now, if only I could make that new rug lay down flat. Party at school today. Pinterest making things easy. 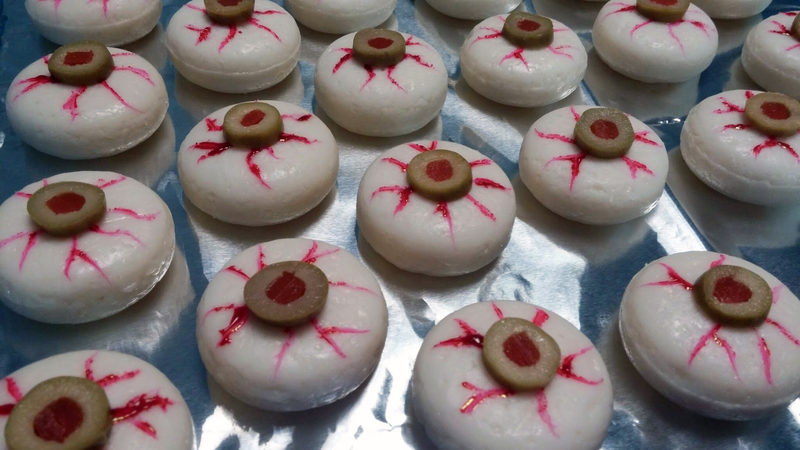 Babybel cheese, gel food coloring, green olives with pimentos. It’s that time of year again. Your husband brings home a four-pack of canned pumpkin and you must accept the not so subtle hint that someone would like pumpkin treats. 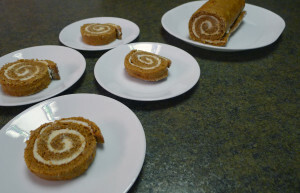 I keep seeing these delicious looking pumpkin rolls online and in stores, so I finally gave in and decided to make a roll. I have never made a roll of anything. No jelly rolls, or swiss cake rolls. It seemed a little intimidating. I wasn’t convinced that it wouldn’t crack and turn into a crumbly mess, but people online said it was easy. Those online people wouldn’t lie, would they? I used a recipe that came through my facebook feed one day, found here. 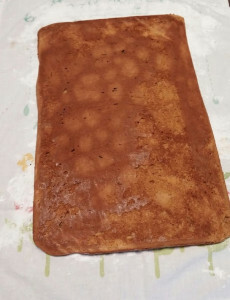 Changes that I made to the cake recipe: doubled the cinnamon and added a ¼ t. allspice. Left half of the powdered sugar out of the filling. Tip #1. I learned that you should grease the pan before putting the wax paper inside. That way it will stick better. My pan worked okay, but the paper slid around a little while I was greasing it. Next time, I will make sure that paper is stuck! Tip #2. You will introduce a large cloud of powdered sugar into your kitchen when you dump your cake onto the towel. I don’t know how to avoid this, but be prepared. Tip #3. Other recipes call for crushed walnuts on top of your batter before you bake. I love walnuts. I think I would have loved the roll even more with walnuts. Yummy, yummy, yummy. 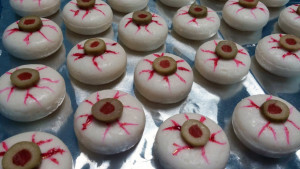 Everyone likes it, and you do not need any extra sugar in the cream cheese filling. It was great with less. 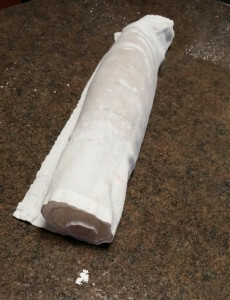 Also, while the wax paper did stick a little and pulled some cake up, rolling it up in the towel was quite easy. I’m not scared of rolls anymore. I’m already imagining lemon rolls with cream cheese filling. 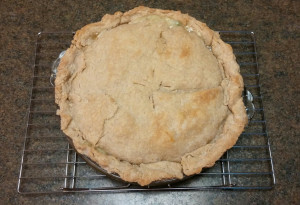 It was a rainy day yesterday and I was in a baking mood so I also made a chicken pot pie from scratch for dinner. 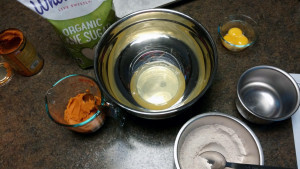 This is the recipe I used (with homemade crust) and it was very easy and so delicious! I HIGHLY recommend it. I halved the recipe as it is really for two pies. I also used a little less thyme, per other people’s comments. Next time, I will make two and freeze one. We have two little girls that always seem to need to put on their shoes at the same time. We used to have one small bench that they both wanted to sit on to do this. “Hello” elbows in the face. 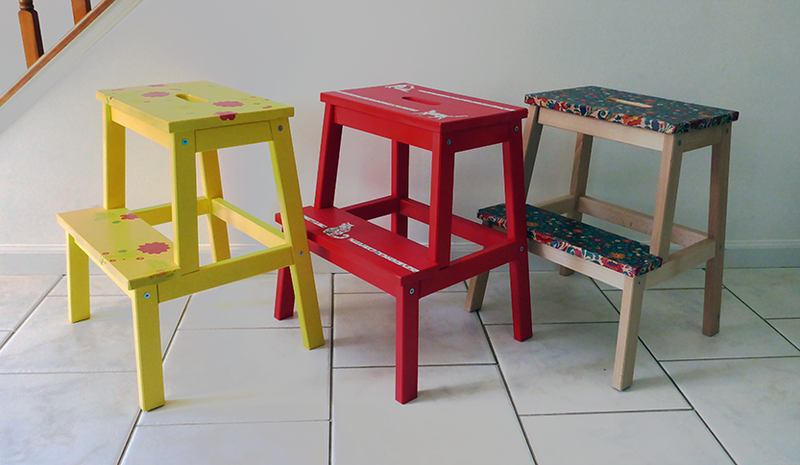 I wanted a stool for each of them. IKEA to the rescue. 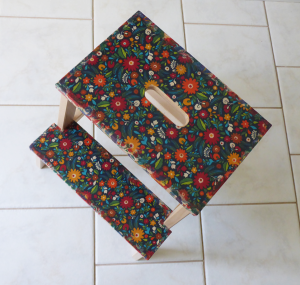 Enter the Bekvam step stool. It’s plain wood. You can fit shoes under it. It costs $14.99. I’ve started to embrace those that have gone before in the home crafting domain. I knew I wanted to make the stools special for each girl. There are a lot of IKEA Bekvam stool hacks online. People painting them, using wall paper, washi tape, etc. I figured at $15 a stool, I could afford to experiment a little. Here are my results. 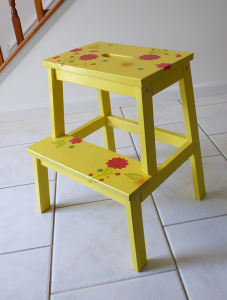 Carys’s stool is spray painted with Rust-Oleum paint. I then used Mod Podge and paper napkins to decoupage it. I sealed the top of the steps with leftover hardwood floor polycrylic. Helena’s stool is also spray painted with Rust-Oleum paint. I decided to use scrapbooking paper to decoupage her stool. Scrapbook paper is about 100 times easier to decoupage with than napkins. She wanted kitties. She got kitties. 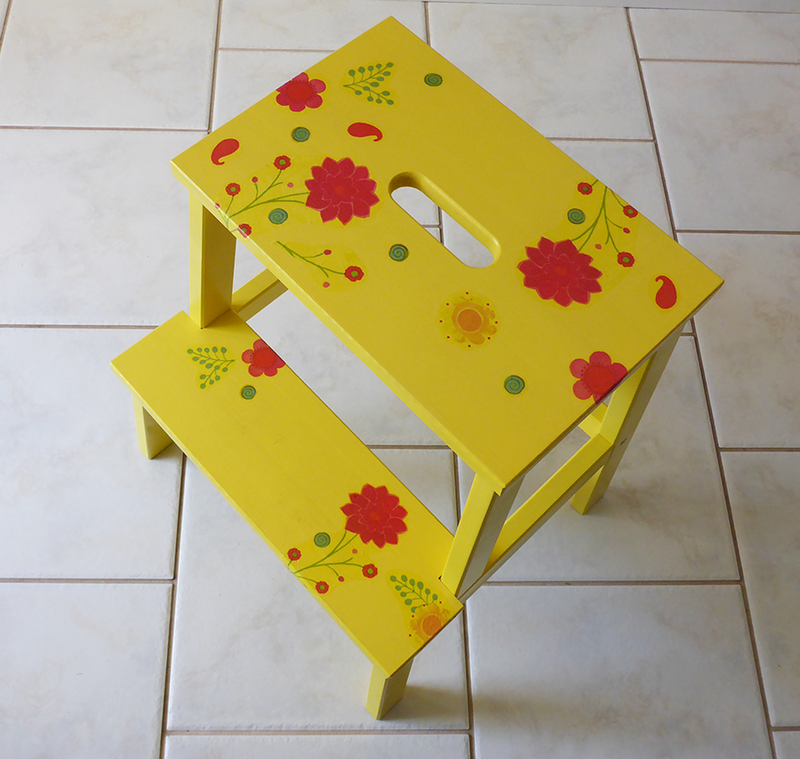 My new kitchen stool, because I’m not as tall as I need to be sometimes. I wanted to try fabric decoupage because other people make it look so easy. Ha! Well, it might be if you do it differently than I did. 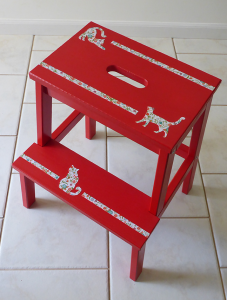 I cut out my stool shaped pieces and slapped them on with Mod Podge, and they stretched, and they moved, and they did not stay exactly the same shape as I cut them out to be. So, I added a border of napkin decoupage just to torture myself a little bit more. I don’t mind how it turned out. Interestingly, the fabric retained a rough texture (even after many coats of the Podge) that makes the stool less slippery. Perfect for clumsy people. And now we have dedicated locations for two girls’ shoes. Carys still sits on the floor sometimes to get her shoes on, but I figure that will change as she grows taller. 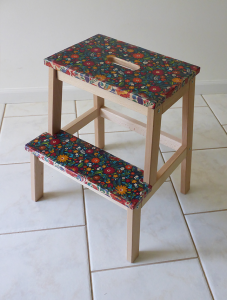 I’m not expecting to grow any taller, so my stool is perfect right now.